It is estimated that there are over 800,000 modern-day slaves in the European Union. A terrible number, yet the issue of human trafficking is relatively unknown in Germany. The Salvation Army focused on this issue in 2015, with the campaign Wir werden night schweign (“We will not be silent”). 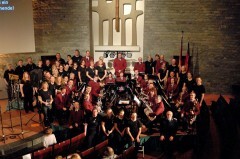 The German Staff Band (Bandmaster Heinrich Schmidt) participated in a charity concert as part of the campaign on 3 October 2015, joined by the Zeitzünder Choir. Both the admission fee and a collection were donated by the participants to the campaign Gemeinsam gegen Menschgenhandel (“Together against Human Trafficking”), in which the Salvation Army is represented, with a total of over €3,000 being raised. This amount will be split between “Pink Doors” and the work of the Salvation Army in St. Pauli. Despite the serious subject, this was a cheerful concert because there are many reasons to be grateful to God. The rousing gospel songs of the Zeitzünder Choir thrilled the spectators, as did the individual items by the Staff Band. A highlight of the evening was certainly Für den König (For the King), with the band and the choir uniting together for the song, which points out that everything is done for God’s glory. The concert concluded with the song Vater Unsers (Our Father). On Sunday, 4 October 2015, the Staff Band led a march along the Einkaufsstraße. Again, this was to raise awareness of human trafficking, with posters and informational materials. In all, it was a truly moving and inspiring weekend where hopefully many people were made aware of the injustice of modern slavery. This article was posted in News and tagged benefit, Berlin, concert, German Staff Band, Heinrich Schmidt, human trafficking, march, Zeitzunder Choir on 3 January 2016 .